WWW.POTATOGROWER.COM 45 TILLAGE EQUIPMENT P.O. Box 190 • Parma, ID 83660 CALL: 208-722-5116 • FAX: 208-722-6012 EMAIL: parmacom@parmacompany.com Innovative Solutions Since 1907 HIGH SPEED DISC www.parmacompany.com HIGH SPEED DISC • Independent Disc Shanks w/ HD 40mm Disc Hub Bearings • Rear Roller Options: Ring, Roller Pipe, Crow foot, or Chevron Paddle • Floatation Tongue with Lock- Out Feature • Rock Protec tion Cushioned Upper Shank • Heav y Dut y Solid Welded Frame • 2 Floatation Carrier Gauge Wheels • 4 Transpor t Carrier Wheels • 24" Notched Disc Blades Rigid Frame Models 14' - 21' 169415Parma12h.indd 1 1/8/18 10:35 AM • Consider CruiserMaxx Vibrance Potato for seed treatment to improve seed germination and crop establishment. 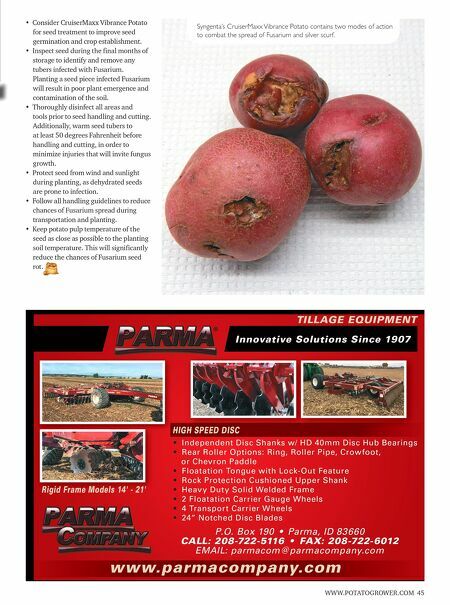 • Inspect seed during the final months of storage to identify and remove any tubers infected with Fusarium. Planting a seed piece infected Fusarium will result in poor plant emergence and contamination of the soil. • Thoroughly disinfect all areas and tools prior to seed handling and cutting. Additionally, warm seed tubers to at least 50 degrees Fahrenheit before handling and cutting, in order to minimize injuries that will invite fungus growth. • Protect seed from wind and sunlight during planting, as dehydrated seeds are prone to infection. • Follow all handling guidelines to reduce chances of Fusarium spread during transportation and planting. • Keep potato pulp temperature of the seed as close as possible to the planting soil temperature. This will significantly reduce the chances of Fusarium seed rot. 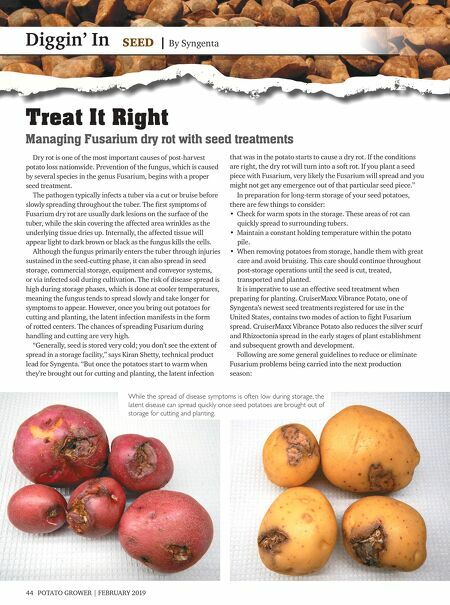 Syngenta's CruiserMaxx Vibrance Potato contains two modes of action to combat the spread of Fusarium and silver scurf.